Small Business Concerns owned and controlled by service-disabled veterans has been established under The Veterans Bene ts Act of 2003 – Public Law 108-183. This act assists federal agencies in meeting the 3% veteran contracting goal. Federal contracting of cers may now set-aside or award sole- source contracts to Service-Disabled Veteran Owned (SDVO) Small Business Concerns (SBC). 51% or more owned by one or more service-disabled veterans. Management and daily business operations is controlled by one or more service-disabled veterans or the spouse of such veteran if the veteran is permanently and severely disabled. At the time of contract offer, an SDVO SBC is small as defined by the size standard corresponding to the NAICS code (13 CFR 121.201) assigned to the contract. This entry was posted in News, Resources, SBA, Veterans on December 26, 2016 by rkenneth. Great resources are available to veteran businesses owners. 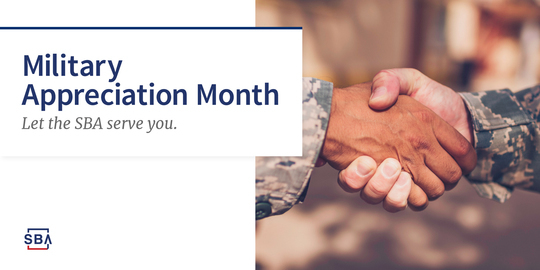 The federal government and non-government organizations provide all sorts of information to help Veterans start and grow businesses. According to the Department of Veterans Affairs, veterans are 45% more likely than their civilian counterparts to become successful entrepreneurs. This entry was posted in Grow Your Business, SBA, Startups, Veterans on November 11, 2015 by rkenneth. Sign up with the veteran-owned business directory. From the May 2015, Bainbridge Island Chamber of Commerce newsletter. 3. Public recognition of your status as a Veteran Owned Business. Even if you are not planning to directly do business with the State of Washington, customers like to know they are patronizing Veteran Owned Businesses. It is free. It is quick. It is easy. And you as the business owner control the level of contact and communications with State agencies. This entry was posted in News, Veterans on May 2, 2015 by rkenneth.